Mark and I began our home building career by working for my dad PD Gravett when we lived in Northern Virginia. We worked on many homes that my dad designed and built throughout Reston, Great Falls, and McLean, Virginia. But we only worked on one project with him based in the Outer Banks. In 2003, we asked my dad to design a custom spec home for us to build and to showcase our work on the Outer Banks. 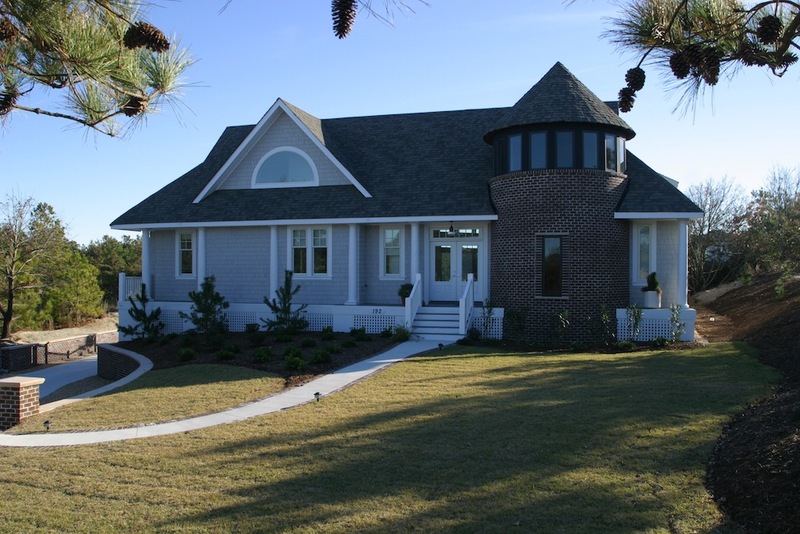 “Bright Lantern” was showcased in the 2004 Outer Banks Home Builders Association Parade of Homes. It received a Judges Award for Excellence and a People’s Choice Award! “Bright Lantern” was inspired by a combination of the Cape Cod coastal architecture and contemporary design. As you walk up the walkway towards the red brick lighthouse with black framed windows, you realize this house is like nothing you have seen before. Upon entering the front door you recognize the sweeping curves on the outside carry through to the circular stairs, curved granite countertops, and the curved glass panel wall. All the living areas have views of the concrete swimming pool. Additional details include Pella windows and doors, Thermador appliances, maple floors, contemporary lighting, aluminum rails, and a Kohler shower tower in the master bathroom. “Bright Lantern” was sold to a true contemporary lover of architecture who still resides in the home. View the portfolio for “Bright Lantern” here.